Housed in a quirky pink, yellow, green and red painted building is the Rose Hotel. 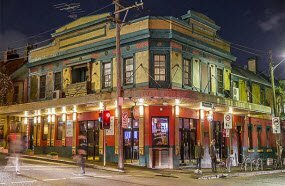 This 100 year old pub has grown to become one of Sydney’s hidden gems. Inside you will find an extensive menu with all of Australian’s best loved foods (including pizza), alternatively you can enjoy your meal in the welcoming courtyard . Must Try Dishes: It may not be notoriously known around the world, but any Australian would tell you that a ‘Parma’ is the most Aussie meal. In essence it is a crumbed chicken breast with ham, sauce and cheese melted over the top. The Rose Hotel offers Sydney’s best Chicken Parmigiana, served with fresh salad and chunky fries. The Sweetheart’s Rooftop is a lovely relaxed terrace surrounded by lovely greenery to make quite the oasis, allowing you to forget that you’re in a big city. The main focus here is on barbequed food, and no one does a barbeque quite like the Australians. Sweethearts ticks all of the boxes, good food, music, drinks, location and great atmosphere. Must Try Dishes: For the best BBQ experience try out the banquet menu which allows you to try a variety of barbeque meat including steaks, lamb rump and salmon – all barbequed to perfection of course! 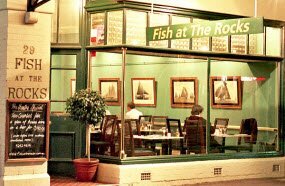 An Australian holiday is never complete without trying some of the great local seafood and for that you simply cannot get any better than Fish at The Rocks. The nautical themed restaurant is the perfect place to wind down after a busy day, with calming light blue walls and soothing music to enjoy whilst eating your great food and drinking some lovely wine. The menu explores a vast variety of seafood, cooked with a contemporary twist, guaranteeing you a unique meal. Must Try Dishes: You can’t go past the Chiefs signature dish, a whole, de-boned, Barramundi stuffed with prawns, vegetables and red coconut curry sauce, served with steamed rice. The mouthwatering dish melts in your mouth and offers a true representation of Australia’s multicultural cuisine. 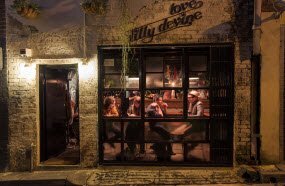 Love, Tilly Devine reinvented an old stockroom into an industrial-style, classy hipster hang-out with over 300 varieties of wine from all of the more neglected wine regions throughout the world. The philosophy behind the wine bar is that patrons care more about quality than the do the region in which the wine was grown, contrary to popular belief. Therefore, you can expect great tasting wine whilst supporting small businesses (something Australians are very passionate about). Must Try Drinks: Described by the owner as “one of the wine world’s real wonders” is Viognier, a white wine similar to Chardonnay with its full-bodied and lush texture. However Viognier includes more aromatic notes of peaches, violets and pears. For the perfect tasting try the quirky-named Thick As Thieves ‘Fancy Pants’, an Australian made wine. Fancy sipping on your cocktail whilst admiring some million dollar views of the Sydney Opera House? Of course you do! 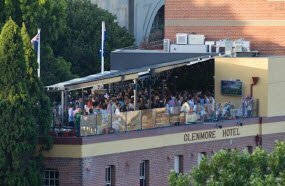 The Glenmore is a typical Aussie pub, with a not-so-typical undisturbed view of Australia’s most iconic building. The retractable roof ensures that rain, hail or shine you can enjoy the view with a great drink and even better company. Must Try Drinks: Try the Glenmore’s signature drink, the Strawberry and Basil Caprioska; a combination of vodka, muddled lime, sugar, basil and of course fresh strawberries. Perfectly refreshing for Sydney’s hot summer nights. Australian’s love their beers and there’s a good reason for that, as you will discover at the Redoak. 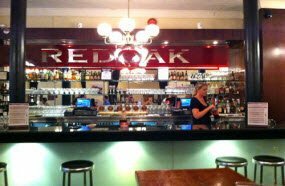 Redoak is a small independent brewery and restaurant specializing in craft beers,which have won awards both within Australian and outside. 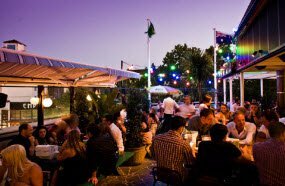 To top things off the bar, one of Sydney’s first craft beer bars, runs completely on solar power! Must Try Drinks: To get the best Aussie beer experience you shouldn’t limit yourself to just one beer, this is where the Tasting Board comes in. It allows you to taste four beers with four seafood dishes that perfectly complement each beer – what could be better.